When we arrived in the U.S. in 1945, we spent a month in a rundown motel in Lindsay, California. My Dad, who’d completed a three-year contract as a mining engineer in Chile, soon found work as a city engineer in his home town of Exeter, 10 miles away. While we stayed at the motel, someone gave me a 78 RPM LP record of a song called “Blood on the Saddle.” It was music that no three-year-old should be exposed to. When my mother realized what the words were, she hastily threw it away. 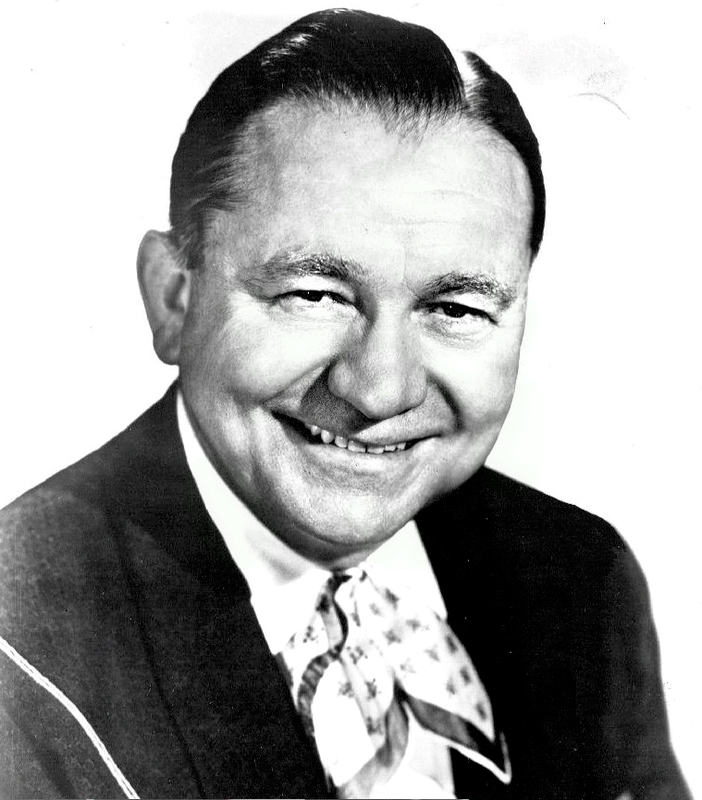 It was a comic country-western ditty with deliberately gruesome lyrics, delivered in lugubrious style by Tex Ritter. You can hear him sing it below or watch him perform it in the 1937 film, Hittin’ the Trail. A sure instinct told my mother this wasn’t suitable fare for her baby boy. No doubt Mom knew what she was up to. There’s a sixth sense that tells us it’s a really bad idea to allow just any old influences to enter our consciousness. 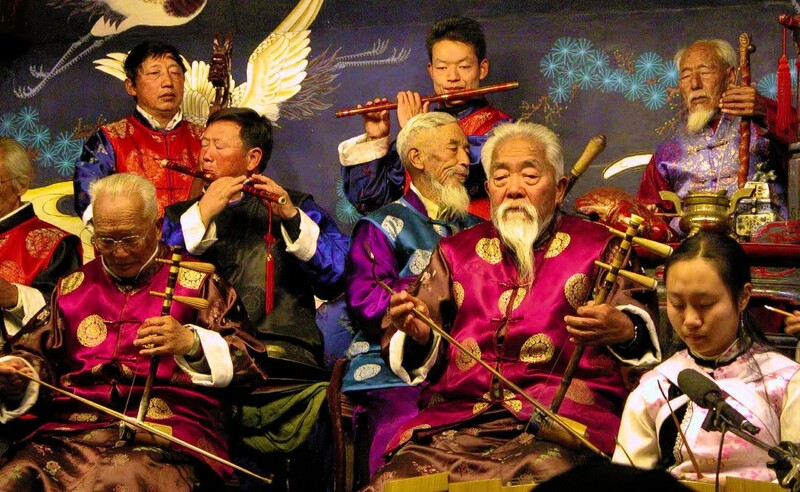 A legend has it that the Chinese emperors of ancient times would gauge the well-being of the realm by visiting the provinces and listening to the musicians. If the music was harmonious, expressing vibrations of balance and contentment, the emperors knew the land was in good shape. What would those emperors think of today’s music? I’m guessing they’d be horrified. Jetting back to this country from places where the air is clean and the music is innocent and sweet, it feels like a psychic assault to be bathed in the torrent of gangsta rap. I’m fascinated by how music influences us. I’ve mentioned how, at the California International Marathon in the early 1990s, I was impressed by how the bands along the course lifted my spirits. When the music faded, I was left to my own devices. Raising my mood in the final stages of a marathon was never easy. It made me wonder why the bands were always in the first miles. Outside influences affect us by a process known as entrainment. They set up a kindred vibration in our bodies and minds. 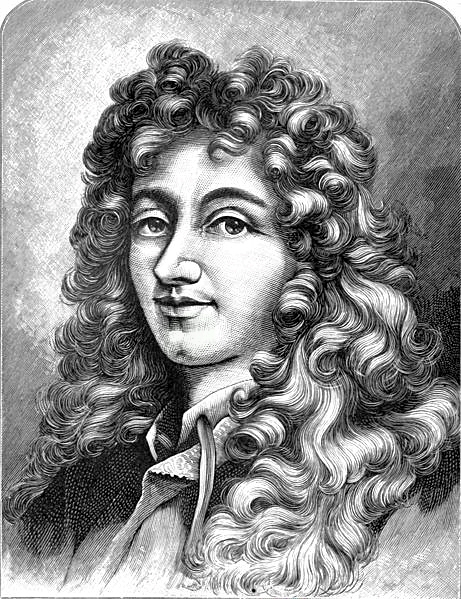 I latched onto the concept of entrainment in an article about Christian Huygens, a seventeenth-century Dutch physicist who first noticed the phenomenon. Scientists have since identified many instances where two separate entities will entrain their frequencies. A famous example is how female college roommates may find their periods synchronizing. 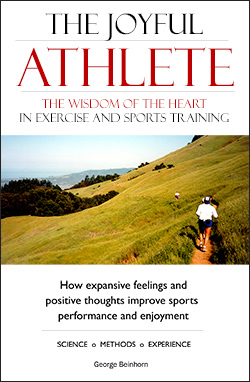 In The Joyful Athlete, I describe how scientists at the Institute of Heartmath are studying the powerful effects of positive and negative feelings on our physical, mental, emotional, and spiritual well-being. Positive feelings such as love and compassion are so powerful that the IHM researchers have given their effects a special name: “physiological coherence.” The plain-English translation: good vibes harmonize our bodies, hearts, and minds. They’re good medicine. The IHM scientists explain that the heart continually “changes speeds.” In the presence of calm, expansive feelings such as kindness, compassion, etc., the speed-changes are regular and steady – when charted, they make a smooth, sine-wave-like curve. Hence the term coherence. But when we’re angry, resentful, vengeful, or feel hurt or despondent, our hearts beat in a chaotic, random rhythm. Positive feelings enable the physical heart to work more efficiently at any heart rate. Thus, if you want to run fast with less effort, it’s a good idea to harmonize your feelings during the warmup as well as your lungs and legs. As I said, I’m interested in music as a way to lift my heart and improve my sports performance. My interest isn’t passive – I sing regularly with three groups. We sing a repertoire of 400 songs composed by my spiritual teacher. You can hear an example below. My teacher said he’d never written a single note that wasn’t inspired by a higher source. I absolutely believe this, because I feel it when I sing. While I was learning the music, I would sing the part for up to an hour and a half while driving the country roads of the San Francisco Peninsula. I sang the song until I could grasp its meaning and sing the harder parts with ease. Frank Sinatra knew the value of becoming intimately familiar with a song before he performed it. Before he even began to practice a new song, he would read the lyrics at least 250 times. My singing profoundly affected my running. It created a place inside where vibrations of harmony seemed a natural part of my being, and where I found an enjoyment that sometimes bordered on bliss. Singing the music in a large or small group was a very, very healthy thing to do. I guess that’s why my attention was drawn to a recent article by Manuel Varlet, The secret to Usain Bolt’s speed may lie in synchronicity. Varlet cites a report of a study by Michael J. Richardson in the Journal of Experimental Psychology: Human Perception and Performance that suggests Usain Bolt synchronizes his steps with those of his competitors. I doubt any runner who’s ever trained in a group will doubt this. I remember long runs in the 1970s with my friend Robin Nowinski that ended on a wonderful 5-mile downhill stretch of swooping mountain road with views of the Pacific and the Bay. We ran in silence, our strides locked-in and synched. I could swear that our consciousness melded in some barely discernible fashion, our auras drifting together in silent communion. 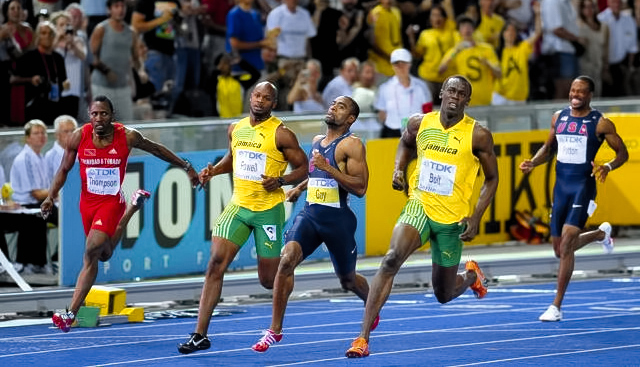 The Bolt study employed video analysis to determine that 30 percent of Bolt’s strides were precisely synchronized with Gay’s in the 100-meter final at the 2009 World Championships, where Gay ran finishing second, in the lane next to Bolt (photo above). To explain the process, the researchers harkened back to the synchronizing clock pendulums that Christian Huygens noticed 350 years ago. They cited the many instances of entrainment that science has identified, including complex systems that affect the universe, the lighting of brain neurons, and the flickering of fireflies. The movements of two or more people interacting together tend to spontaneously entrain to each other. Without specific intention or instructions, their movements can become perfectly synchronised simply due to the exchange of visual and auditory information. The steps of two family members can entrain to each other when walking side-by-side. The rhythmic applause of a crowd in a concert hall can become spontaneously synchronised after a short time. The scientists wondered if entraining ourselves to the other people can have beneficial effects. Previous research has shown that interpersonal synchronisation can facilitate successful social interactions. Synchronisation can enhance feelings such as affiliation or connectedness of people interacting and the occurrence of pro-social behaviours, even the efficiency of their communication…. In Love and Survival, Dean Ornish, M.D. 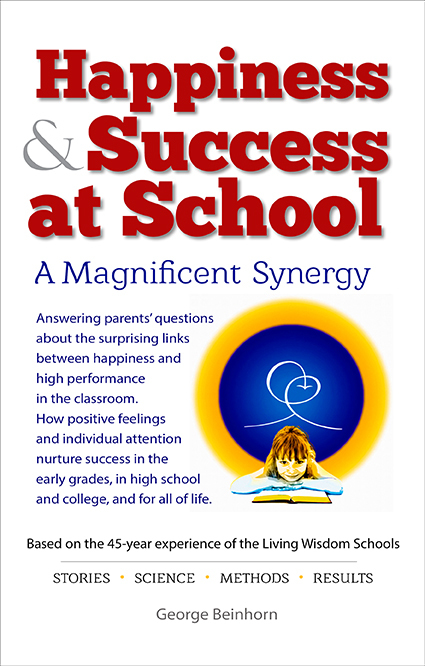 reviews dozens of studies that indicate people who live in cultures where extended families are the norm are healthier as a result of entraining themselves to the people who support and encourage them. Running in sync with Robin Nowinski 40 years ago, I wasn’t looking to improve my social ties, or even my race performances or my health. I was an untalented plodder with lingering spasticity and numbness in his legs from a three-year paralysis and two major surgeries. I was more interested in running as a path to simplicity, serenity, self-integration and joy. Regardless, the scientists who studied Usain Bolt believe that entrainment may have significant benefits for competitive runners. Some recent research has shown that running performances can be enhanced when listening to auditory rhythms such as the beats of simple metronomes or music. Music with a prominent and consistent beat can also help to maintain optimal movement tempo and facilitate running efficiency…. It is likely Bolt didn’t even know he was synchronising his steps with Gay. But his doing so may have contributed to his world-record performance. One might wonder: how fast Bolt would have run had Gay not been there – or if Gay had run at an even higher tempo? The Heartmath researchers found that when people stand close to one another, up to 5-6 feet apart, their heartbeats tend to synchronize. 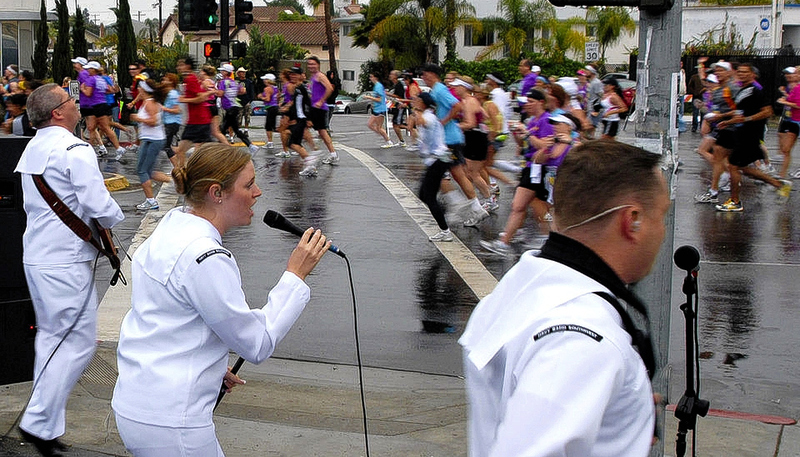 After a Joyful Athlete workshop years ago, a female attendee who was in the military said that she loved running to a cadence with her fellow troops because it engendered feelings of closeness and unity. The most powerful performance boost identified by the IHM researchers occurred when the heart was permeated by feelings of love, compassion, kindness, etc. IHM sells recordings of music and sounds designed to harmonize the heart and improve mental and physical performance. At any rate, there’s real-world evidence that entrainment works for runners. 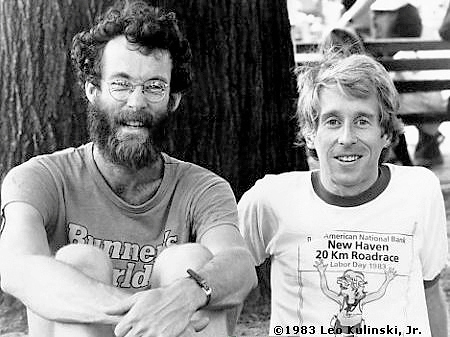 America’s distance runners have enjoyed their best successes when they trained together, whether they were drawn together by instinct or to train with a proven coach. 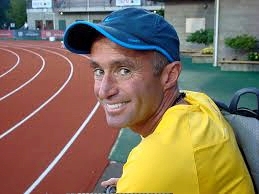 The examples are abundant: Frank Shorter’s pre-Olympic training with the Florida Track Club; Bill Rodgers’ sometimes-training with the Boston Athletic Association, Steve Prefontaine’s training with Bill Bowerman’s tight band at the University of Oregon; and today’s industry-sponsored clubs, including Alberto Salazar’s Nike Oregon Project and the Brooks-Hanson and Nike Bowerman groups. It was unquestionably a factor in Arthur Lydiard’s successes that his athletes trained together and were friends. The same is of course true of the Kenyans. If you aren’t pickin’ up good vibrations when you run, you may be missing out. This is peripheral, but I believe one of the best ways to get to know someone – his or her core values and character – is by feeling the vibes that emanate from the person. It’s one reason I believe the allegations that Alberto Salazar has drugged his athletes are utterly false. As a writer on positive values in sports, I felt duty-bound to read Salazar’s long rebuttal of the rumors. Aside from the convincing, well-documented case he makes, I felt while reading it a positive vibration of righteousness and goodness emanating from the consciousness of the man. I may have more to say about this, and I probably won’t omit to include remarks about the less principled members of the working press. Robin Nowinski was my dad! How thrilling to read this and find his inclusion. My dad struggled with mental health issues that eventually overtook him, however running and music were absolutely his passions. You have touched my heart in a profound way, just knowing that he is remembered in such a wonderful light.